SACRAMENTO — Hours before the Sacramento Kings played their N.B.A. 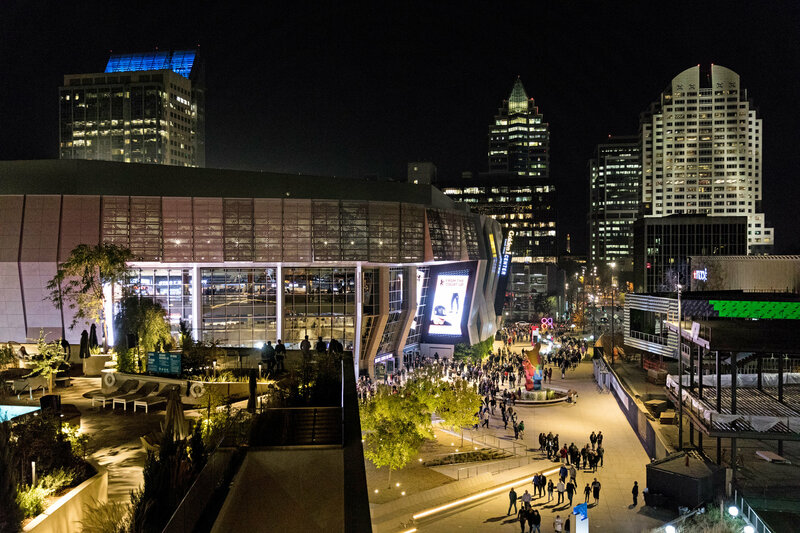 home opener in October, Vivek Ranadivé stood on the balcony of the team’s new fourth-floor office at the $1 billion Downtown Commons. He watched hoops fans stream into the year-old Golden 1 Center. He smiled at guests swimming in the rooftop pool of the brand new, 250-room Kimpton Sawyer Hotel. Below him, the open-air plaza at street level bustled with life. No longer. Three years after Mr. Ranadivé, the owner of the Kings, partnered with the city to scrape away a nearly empty downtown mall, and a year after he opened the arena and the 1-million-square-foot commons, Sacramento is a city reborn. The number of downtown jobs has increased 38 percent, according to the Downtown Sacramento Partnership, a city economic development group. In the last year, 27 new stores have opened and 23 others are scheduled to open this year. So much construction is happening that the city has decided to hire two dozen new employees to process applications and building permits. And Sacramento is not alone. Across the country, in more than a dozen cities, downtowns are being remade as developers abandon the suburbs to combine new sports arenas with mixed-used residential, retail and office space back in the city. The new projects are altering the financial formula for building stadiums and arenas by surrounding them not with mostly idle parking lots in suburban expanses, but with revenue-producing stores, offices and residences capable of servicing the public debt used to help build these venues. In Columbus, Ohio, Nationwide Realty Investors has constructed the 75-acre, $1 billion Arena District, with an N.H.L. arena (home to the Blue Jackets), surrounded by 1,030 apartments, 2 million square feet of commercial space for 80 businesses, a minor-league baseball stadium, restaurants and stores. In Cincinnati, the Banks, a new $1 billion mixed-used district, has emerged on the Ohio River shoreline between the city’s baseball and football stadiums. In Inglewood, Calif., a $3.8 billion, 298-acre mixed-use development currently under construction will include a privately financed N.F.L. stadium to be shared by the Los Angeles Rams and the newly located Los Angeles Chargers. And in Detroit, the $863-million, 19,500-seat Little Caesar’s Arena, home to both the Pistons and the Red Wings, opened last summer in amid the 50-block District Detroit, a $1.2 billion mixed-use neighborhood. The explosion in mixed-use developments like these is owed, in part, to the urban American economic renaissance. City populations grew faster from 2010 to 2016 than those in the suburbs, reversing a 60-year trend that started in 1950, according to census data. And cities — not suburbs — are the now primary generators of the nation’s economic growth, according to research compiled by the Federal Reserve. For years, owners used their team’s popularity or perceived economic importance to strong-arm government officials. In many cases, owners threatened to move their teams if governments did not build them new stadiums along with the roads and public utilities needed to operate them. A 2016 study by the Brookings Institution found that 45 stadiums and arenas for the four major professional sports — football, baseball, basketball, hockey — were constructed or renovated in the United States from 2000 to 2014 at a cost of nearly $28 billion. Of that, $13 billion was publicly financed with tax-exempt bonds. Examples of that are legion, particularly for N.F.L. stadiums. In the early 1990s, St. Louis city and county, and the state of Missouri, spent $258 million to build a 70,000-seat domed stadium downtown to attract an NFL team. The city lured the Rams, who played in the stadium from 1995 to 2015 before moving back to Los Angeles. The city, county and state still have $140 million in debt, and millions more in annual maintenance costs to pay until the debt service is completed — on an empty stadium — at the end of 2021. Urban design specialists also raised their voices in opposition to the old model. They noted that generous public-stadium financing ignored almost every facet of sound real estate development, like location. America was producing a generation of isolated arenas in the suburbs and countryside, ringed by giant parking lots, many of which sat empty much of the year. That certainly characterized Detroit’s comparatively brief experience with suburban sports stadiums. In 1975, the NFL Lions moved from the nine-acre, 63-year-old Tigers Stadium in Detroit’s Corktown neighborhood to the $55.7 million Silver Dome in Pontiac, which was surrounded by over 100 acres of surface parking near the center of the struggling Oakland County city. The team stayed until 2002, when it returned to Ford Field, a $500 million stadium alongside the two-year-old $300 million Comerica Park, the baseball Tiger’s new home on Woodward Avenue in downtown Detroit. Both stadiums were partially financed with taxpayer dollars. 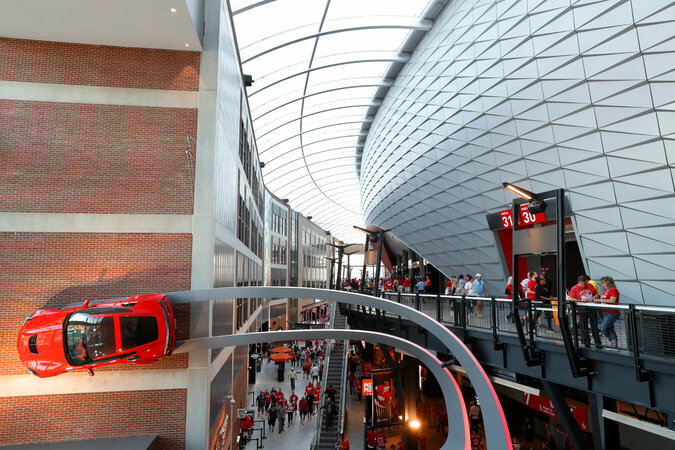 Last year, Little Caesars Arena opened across the avenue, completing a strategic development vision, developed by business and civic leaders in the 1990s, that focused on professional sports as a catalyst for Detroit’s revival. The NBA Pistons play in the new arena after spending the previous 29 seasons in The Palace of Auburn Hills, a 22,000-seat arena in a prosperous suburb 33 miles north of downtown Detroit that opened in 1988. The Palace held its last event in September and is scheduled for demolition. Its 109-acre site, most of it surface parking, is being rezoned as a campus for high tech business and research. If there is particularly good model for what’s happening in Sacramento, it can probably be found in Kansas City and the city’s Power and Light District. The $1 billion, 12-block district features a 150,000-square-foot covered plaza, more than 50 restaurants and taverns and hundreds of market-rate apartments. It opened in 2007 next to the city’s publicly financed $263 million, 18,500-seat Sprint Center, which, though it does not host a professional team, has been frequently used as a site for college basketball games, including regional rounds of the annual NCAA tournament. A decade later, the Power and Light District, developed by the Cordish Companies — whose chief executive, David Cordish, is credited with being a leader in sports-focused mixed-use development — is cited by city officials as the primary reason that a 2.5-mile, $102 million downtown streetcar line in the city center started in 2016. Thousands of new apartments opened, the downtown population increased to 30,000 from 8,000, and city tax revenue soared.